Astronomers have combined data from the Voyager spacecraft and the Hubble Space Telescope to probe the stuff between the stars. Astronomers used the Hubble Space Telescope to study stars lying behind the Voyager 1 and 2 spacecraft from Earth's perspective, as demonstrated in this illustration. The distance scale is logarithmic. The stars' spectra enabled the team to map the structure of the interstellar medium along each spacecraft's route. The Sun and its cohort of planets, dwarf planets, and variegated rubble move through what’s called the interstellar medium. The ISM is mostly sparse gas, with an average density of roughly 1 atom per cubic centimeter. For comparison, air at sea level on Earth is about 30 million trillion times denser. So you can understand why the ISM is hard to study. Astronomers manage it by looking at how the ISM absorbs light from distant stars, which has to pass through the intervening gas to reach us. Using this technique, Julia Zachary, Seth Redfield (both Wesleyan University), and Jeffrey Linsky (University of Colorado, Boulder) came up with a clever experiment to probe the stuff that the two Voyager spacecraft are currently flying through. They presented the results January 6th at the American Astronomical Society meeting in Dallas. 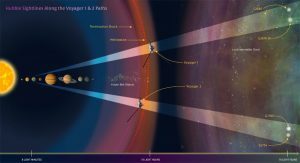 Voyager 1 exited the solar system in 2012; Voyager 2 is still in the heliopause, the boundary region where the solar wind and interstellar medium collide. Both plucky spacecraft are still functioning, measuring the density of the ISM around them. But their on-location data doesn’t give much of a big picture. To get that Google Earth view, Zachary and her colleagues used the Hubble Space Telescope to look at four stars along the same lines of sight — two behind Voyager 1, and two behind Voyager 2 from our perspective. The stars’ spectra revealed that magnesium and carbon atoms had absorbed some of the starlight en route. There were multiple absorption features, spread out in space (indicated by the Doppler shift of the spectral lines), revealing that there were several clouds. The clouds in Voyager 1’s direction aren’t the same as those along Voyager 2’s route, either, confirming the ISM is clumpy. But the team learned more than that. The total amount of starlight absorbed also reveals the ISM’s density along the line of sight. That information the team combined with the clouds’ total volume density, determined from previous observations, the Voyager craft themselves, and the current observations’ detection of carbon atoms that have been boosted to a higher energy level thanks to collisions. The team could extrapolate how dense the ISM is based on how many collisions are necessary to produce the excited carbon. There is an interstellar cloud that both Voyager 1 and Voyager 2 will pass through just as they exit the solar system. However, their divergent trajectories will take them through different clouds after that. Voyager 2 will move out of the cloud that swaddles the Sun in about a thousand years. Two additional clouds exist along its sightline; based on the craft’s speed, it will spend 90,000 years in the first one it reaches, then move into the next one after that. Voyager 1's fate is less clear: one of its stars has two clouds in front of it, the other doesn't, so what will the craft hit? Both Voyagers will hopefully continue working for another 5 to 10 years. After they shut down, they’ll continue flying along their slingshot routes. As the Hubble press release notes, Voyager 1 will pass 1.6 light-years from the star Gliese 445 in about 40,000 years; Voyager 2, on the other hand, will zoom within 1.7 light-years of Ross 248 around that same time.